« Dry Out In The Forecast! Weather continues to be unseasonally cool. Temperatures have been in the upper 70s. This morning on the way to work, it was 57 degrees! August! We are looking at upper 70s today and low to mid 80s through next weekend. And best of all, looks like very slim chances of rain during this period. The flood gates were turned off Thursday around 9:00 a.m. Three generators are still in operation with them running at the equivalent of two units. Not bad, but still limits the wading opportunities. Table Rock Lane is at 717.7 feet and we expect them to keep running until we get right at 717 feet or lower. Monday, with the five flood gates and 3 generators going, Stan took Steve from Texas out for half a day. Not only did they have lots of water in the river, it rained on them before they got off the water. Good day, however, on the big ruby midge, a peach egg and the holographic green crackleback. Meanwhile, Jim and his two wet fly fishers, Harry and Barry, also from Texas, were catching fish on the red midge with either a blood worm or rusty midge dropper. Not a lot, but enough to keep them busy. Wednesday, the Rick clan from all over, fished half a day with Dana, Darrell, Jim, Gina and Stan. First time this group had seen all this water. Overall, it was a successful day. Almost everyone caught fish and had a good time. Big ruby, peach egg, white San Juan worm, white grub, Red San Juan worm and the rusty midge were the patterns for the outting. Renee was the new fly fisher in the group so we put her with Gina. Good start for Renee don’t you think? The flood gates shut down Thursday some time around 9:00 a.m. Even with the dropping water, fishing was very good. Stan had Ron from Kansas out all day. They had a great day on the white San Juan worm (shad kill), the grub and the big ruby midge. Carolyn was finishing up the two-day school Allison and Roy took. This was their graduation day and they had a very good day also on the black zebra dropped from a big ruby midge. 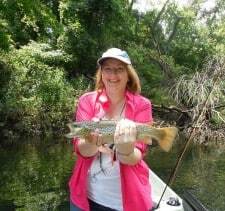 We also pulled some fish on the holographic green crackleback and a white zonker using the intermediate sinking line. 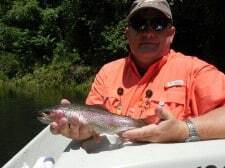 This entry was posted on Saturday, August 17th, 2013 at 10:36 am	and is filed under Fishing Reports. You can follow any responses to this entry through the RSS 2.0 feed. You can leave a response, or trackback from your own site.